in addition to being a great sponsor, they have also outfitted me with some adorable sunglasses for summer (shown above). i have been loving my new DVF sunnies which have made the perfect summertime accessory. 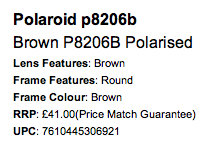 Sunglasses Shop has graciously offered to giveaway a pair of Polaroid Polarised sunglasses (shown below) to one Blushing Basics reader (did i mention this was the week of giveaways?!) go ahead and follow the Rafflecopter steps below to enter for your chance to win a pair of these gorgeous glasses. if you are interested in checking out more of their merchandise, designer options included, you can head to us.sunglassesshop.com to see the full selection. they ship internationally and i received my products promptly. kudos to sunglasses shop. I love sunglasses. This are simply part of this summer.